Finish with a bang. That was the general vibe in Mona Vale when the brewers of team Modus got together to decide what would be their last limited release canned run for 2017. And what could be more appropriate for a hop focused brewery than an even hoppier beer? 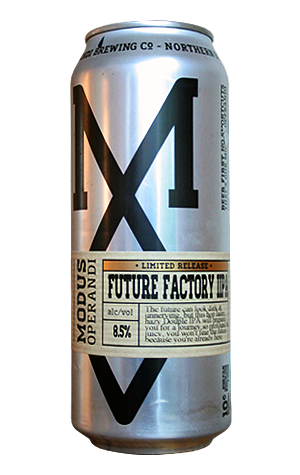 So it is we arrive at the Future Factory double IPA. In creating it they’ve evidently leaned on some of the lessons learned from one of their major projects of 2017, namely a steady exploration of increasingly hazy New England IPAs. Having plumbed the full depths of the murk throughout the year, Future Factory has what you might describe in the ever widening context as a mild haziness. But it’s really all about the aroma and flavour and in that regard it’s a fresh fruit salad, bursting with tropical characters of pineapple and passionfruit from Galaxy and Citra hops. It’s 8.5 percent ABV and, while you do feel a bit of the booze beneath, there’s a honey-like sweetness which adds a mellifluous and ever so slightly sticky feel that washes over the top, preventing any bitterness from getting a firm grip. SO, if you like your beers big, hoppy, hazy and in half litre serves, the tins go nationwide from November 17.